Ted Becker, vice president of marketing for Michelin Americas Truck Tires, shows off the new 'Michelin-on-Michelin' retread. The Michelin X Line Energy D is SmartWay-verified and comes with a 25 percent mileage guarantee. LOUISVILLE, Ky.—Michelin North America Inc. has added two commercial tire products to its portfolio, a dual trailer tire and a "Michelin-on-Michelin" retreaded tire, both for line-haul operations. 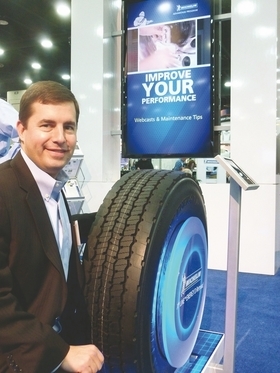 The new retread product, the Michelin X Line Energy D, is unique in that it's SmartWay-verified and comes with a 25 percent mileage guarantee, said Ted Becker, vice president of marketing for Michelin Americas Truck Tires, speaking at the recent Mid-America Trucking Show in Louisville. "We promise to deliver 25 percent additional mileage," he added. That's important, he said, because tires have a tradeoff of performances, and customers often are concerned that if they choose a tire with lower rolling resistance, traction and mileage might be affected. "We're hitting that head on and offering this 25 percent increased mileage guarantee over any competitor's SmartWay-verified retread." The Michelin X Line Energy D is a Michelin-produced retread through and through, according to Becker. It features a Michelin tread, on a Michelin casing, produced through the company's Michelin Retread Technologies (MRT) process offered by Michelin MRT franchisees. "The tread is optimized for performance on a Michelin casing, and that's what allows us to extend this guarantee compared to our competitors," he said. Among the X Line Energy D's features are matrix siping, which provides inter-locking action to promote traction and even wear, the tire maker said. "It's the first time we've brought this siping to a dual product—a dual over the road product in a retread—and it's a 3-D locking sipe," Becker said. "It comes together to form a stable treadblock when it's needed. It allows for increased mileage, then it opens up to all for traction." The tire also features zig-zag groove walls that give biting edges for water and snow evacuation. Traction is enhanced by the use of full-depth and tear-drop sipes, Michelin said. The X Line Energy D comes with a 21/32-inch tread depth. At the Louisville show, Michelin unveiled a new trailer tire, the X Line Energy T, which is replacing the XT-1 and the XTA Energy. The new tire offers the same mileage and durability of the XT-1 but with 10 percent less rolling resistance, Becker said. The trailer axles on a typical tractor trailer account for 42 percent of the vehicle's total rolling resistance, he said. "Everybody thinks about the steer and the drive on the tractor, but often don't realize that the trailer has as many tires as the drive axle, so it's important to concentrate on fuel efficiency there. "So just like our other promises of delivering improved total cost of ownership, we're going to push it as well on the trailer tire, dropping rolling resistance by 10 percent." Michelin has achieved this improved rolling resistance through the use of advanced compounding technology, Becker said. Other features of the tire include a curb guard for sidewall and shoulder area protection and a rectangular bead bundle that reduces heat and fatigue, Michelin said. Michelin is offering the X Line Energy T beginning in May in four sizes: 11R22.5, 275/80R22.5, 11R.24.5 and 275/80R24.5.